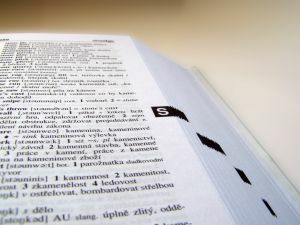 At Acantho we create specific monolingual, bilingual or multilingual glossaries and dictionaries. These are catalogues or books of terms from the same discipline or field of study, or of the specific terminology used by a client for the description of her products. Often on-site research work and smooth communication with the client are necessary for validating the terms of terminology tables. We prepare simple or complex dictionaries and glossaries: these can simply include the original term and its translation or more fields, such as its definition, context, source used, illustration, grammar category, etc. Our glossaries are created with a computer application which interacts with our translation tools in such a way that they can be consulted or automatically check that the terminology used during the translation processes is the right terminology.